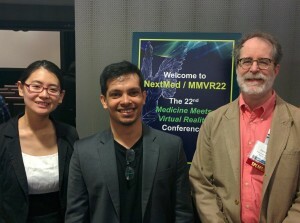 Pain Studies Lab members presented results of their research at the Medicine Meets Virtual Reality (MMVR) 2016 conference in Los Angeles, April 7-9. MMVR is an international scientific forum on advanced computer-based technologies for medical care and education. Its participants are scientists, engineers, physicians, educators, students, military and industry members, and healthcare futurists. Dr. Chris Shaw presented a talk entitled Usability Comparisons of Head-Mounted vs. Stereoscopic Desktop Displays in a Virtual Reality Environment with Pain Patients,” an investigation of simulator sickness in VR displays when used specifically by pain patients. Weina Jin introduced the results of a clinical study involving VR as a method of pain distraction. The study examined the efficacy of a VR “game designed at the Pain Lab specifically for people who live with long-term chronic pain. An example of a serious game,” the study demonstrated that it is an effective method of pain distraction. This and other studies were limited to measuring the short-term analgesic effects of VR, but according to Dr. Gromala, who heads the Pain Studies Lab, chronic pain patients have multiple needs for pain relief,” in the short-term, during times of breakthrough pain, and over long periods of time. She adds, “while we developed a new paradigm for VR that we hope may prove useful for the long-term, we are committed to discovering the ways that VR — or any technology — can help. Ashfaq Amin presented Immersion in Cardboard VR Compared to a Traditional Head-Mounted Display.” This poster describes a study conducted among 30 participants who used 3 different VR displays — Cardboard VR, Oculus Rift DK2, and Desktop. Participants in the study played the same VR game, and their experience of immersion was recorded using an Immersive Experience Questionnaire. Surprisingly, the results showed that Cardboard VR, despite its low resolution, performs almost as well as the Oculus Rift head-mounted display (HMD). Ashfaq, who is exploring affordable mobile VR technologies for pain self-management, carried home a best poster award for his work. The findings of these studies were presented by individual researchers, but are the result of a team of interdisciplinary researchers in SFU’s Pain Studies Lab. The research was made possible by support from the Canadian Foundation for Innovation (CFI), the Canada Research Chair Program, NSERC (Natural Sciences and Engineering Research Council of Canada), NCE-GRAND, and Simon Fraser University; pain experts Dr. Pamela Squire, Dr. Owen Williamson and Dr. Brenda Lau; and patients/members of British Columbia’s non-profit organization PainBC.